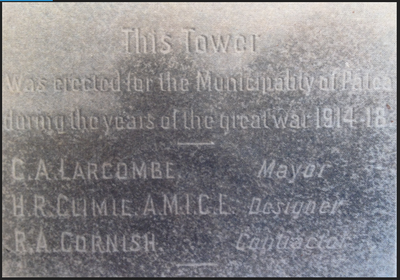 Mr Charles Larcombe first served on the Council in February, 1897, when he was elected in place of C. Potts and served two years. He returned to the council in May, 1901, till 1907. In 1911 he stood against J. A. McKenna in the mayoral election but lost. 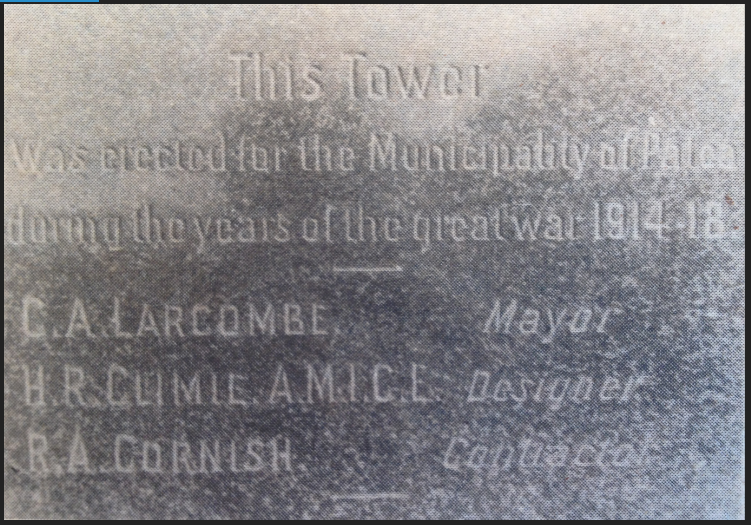 However a second try in 1913 against Dr Simmons who had been deputy mayor gained him the place and he served as Mayor for six years throughout the period of the Great War. A highlight during his term of office was the opening of the Town Hall in May, 1913, and the Water tower behind the Town Hall a couple of years later. 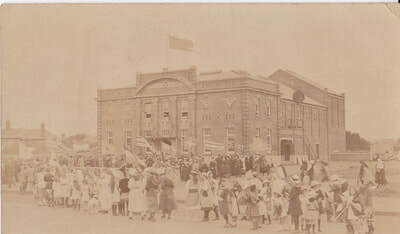 It was his suggestion to establish a Memorial Park with a Memorial Gateway on the Domain site, after the war. Charles was brought by his parents from Bath, England in 1865 and they settled on the West Coast at Greymouth. From his father, Benjamin, he learnt the trade of shoemaker and set up in business at Waikari in North Canterbury and Dunganville on the West Coast. 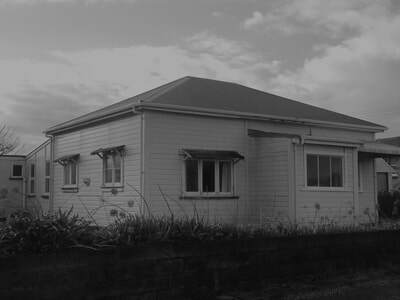 He came to Patea in 1891, set up in the shoe trade and, as well as selling shoes, had plenty of work in shoe repairing and maintained this business until the time of his death in 1936 at the age of 75. Having married Laura Pethybridge in Greymouth in 1890 he brought his wife to Patea and they lived the rest of their lives in Patea where they raised a family of four girls and three boys, Albert, Alice, Harold, Lillias, Edith, Charles & Florence. One of his daughters helped him with the shoe shop in his last years. The family lived at 8 Oxford Street. Among his other interests he was a Freemason for 40 years and was Master of the Patea Kilwinning Lodge in 1901 and 1907 at a time when the lodge was making a steady recovery and growth after the 1890’s depression. He was chairman of the School Board for a while and secretary of the Patea Chamber of Commerce and a member of the Patriotic Society during the Great War. Charles and Laura Larcombe are both buried at Patea Cemetery.